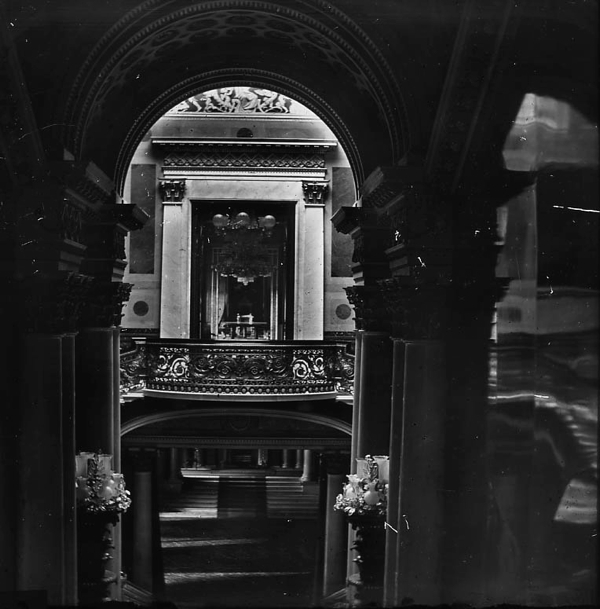 It gives me vertigo just to contemplate the staircases of old London – portrayed in these glass slides once used for magic lantern shows by the London & Middlesex Archaeological Society at the Bishopsgate Institute. 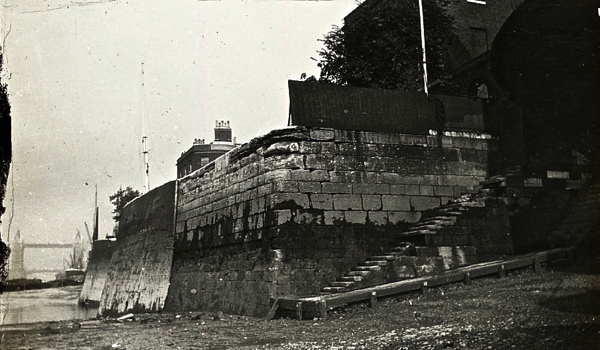 Yet I cannot resist the foolish desire to climb every one to discover where it leads, scaling each creaking step and experiencing the sinister chill of the landing where the apparition materialises on moonless nights. 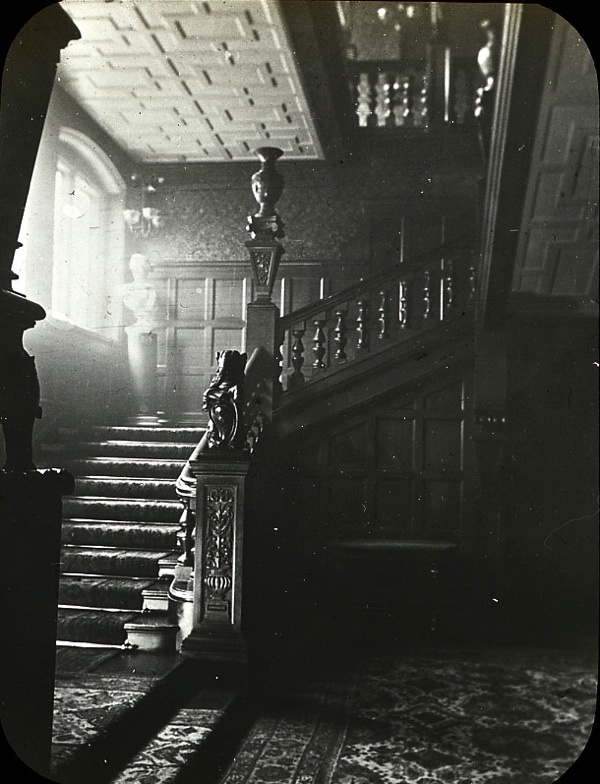 In the Mercers’ Hall and the Cutlers’ Hall, the half-light of a century ago glimmers at the top of the stairs eternally. 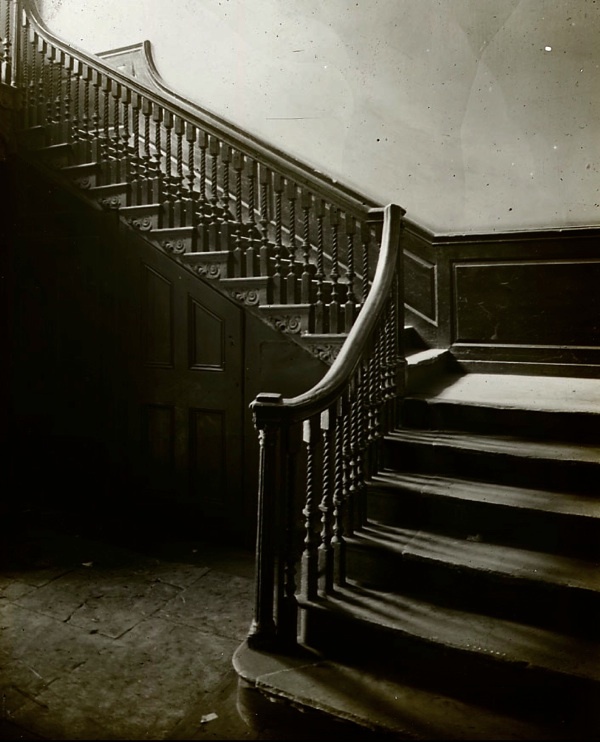 Is someone standing there at the head of the staircase in the shadows? Did everyone that went up come down again? Or are they all still waiting at the top? 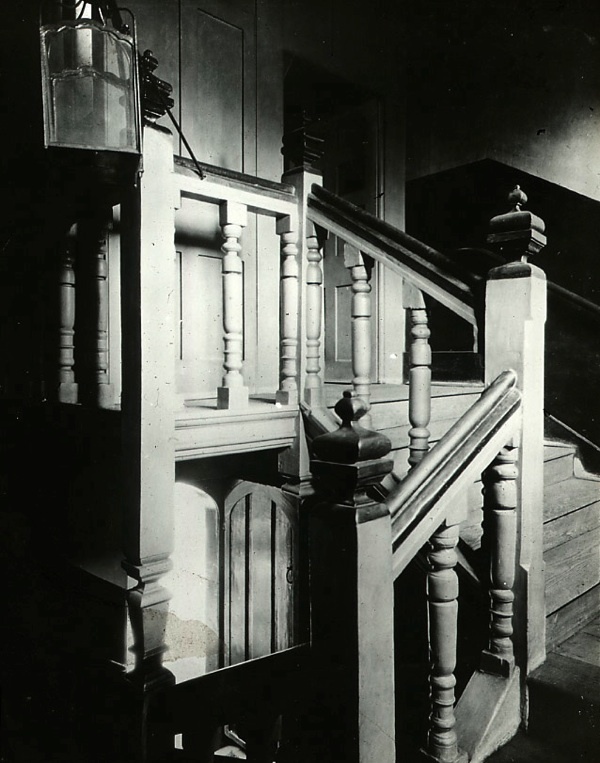 These depopulated photographs are charged with the presence of those who ascended and descended through the centuries. 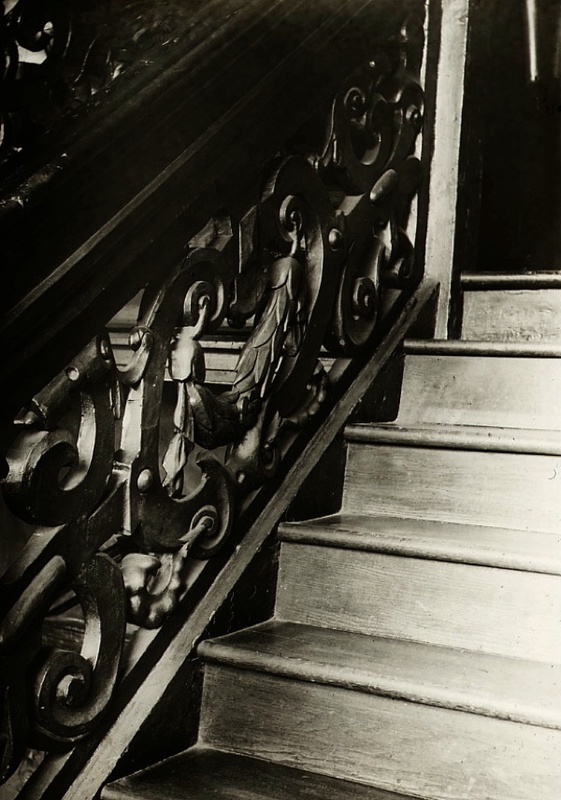 While it is tempting to follow on up, there is a certain grandeur to many of these staircases which presents an unspoken challenge – even a threat – to an interloper such as myself, inviting second thoughts. The question is, do you have the right? Not everybody enjoys the privilege of ascending the wide staircase of power to look down upon the rest of us. 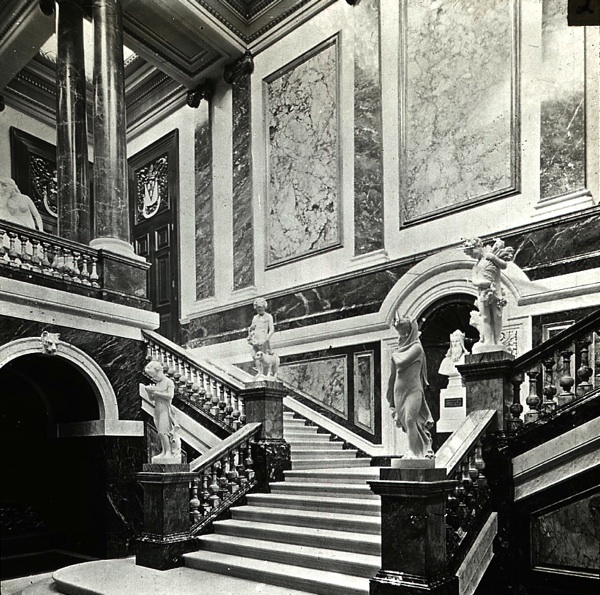 I suspect many of these places had a narrow stairway round the back, more suitable for the likes of you and I. 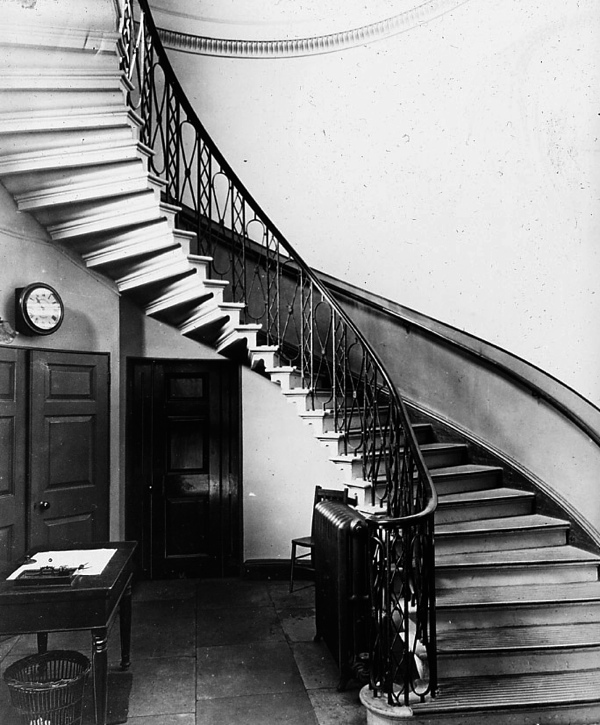 But since there is no-one around to stop us, why should we not walk right up the staircase to the top and take a look to see what is there? It cannot do any harm. You go first, I am right behind you. 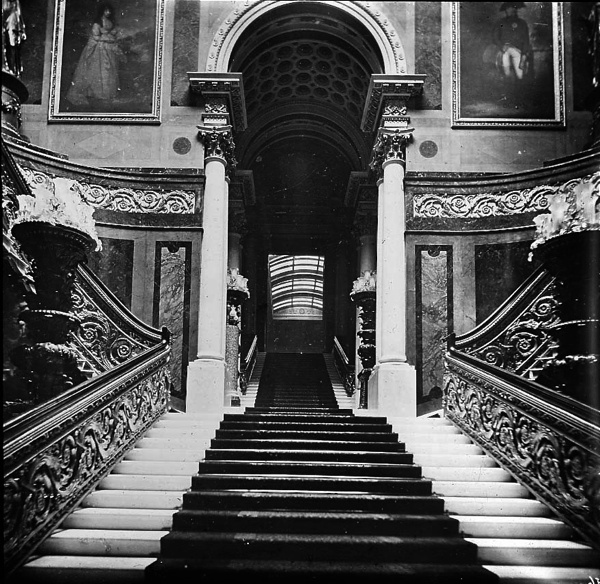 Buckingham Palace, Grand Staircase, c.1910. 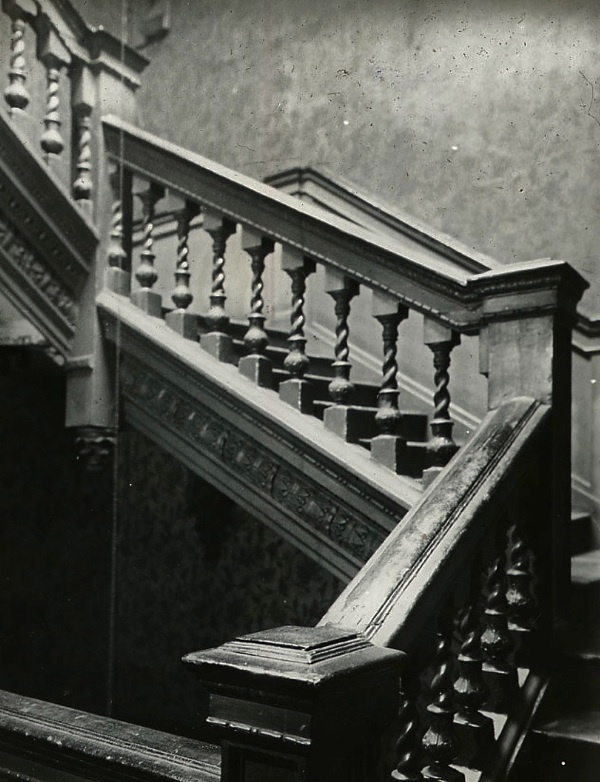 4 Catherine Court, Shadwell c.1900. 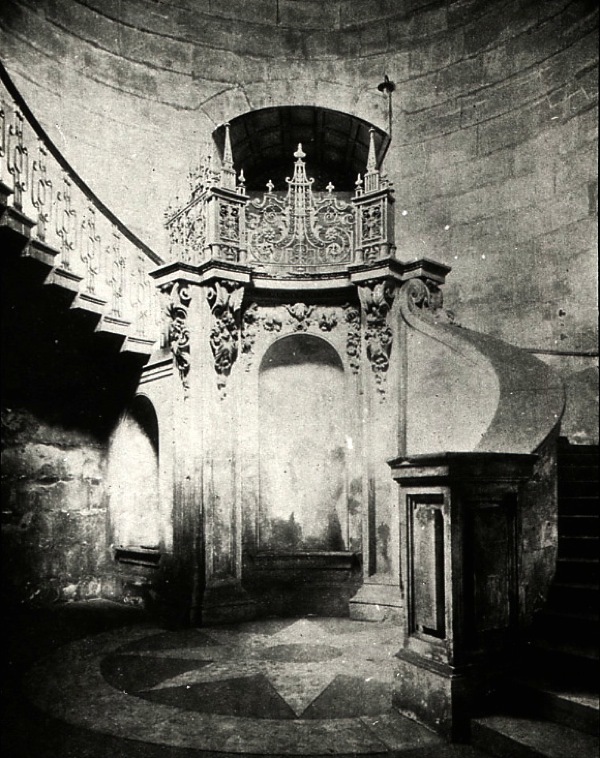 St Paul’s Cathedral, Dean’s staircase, c.1920. 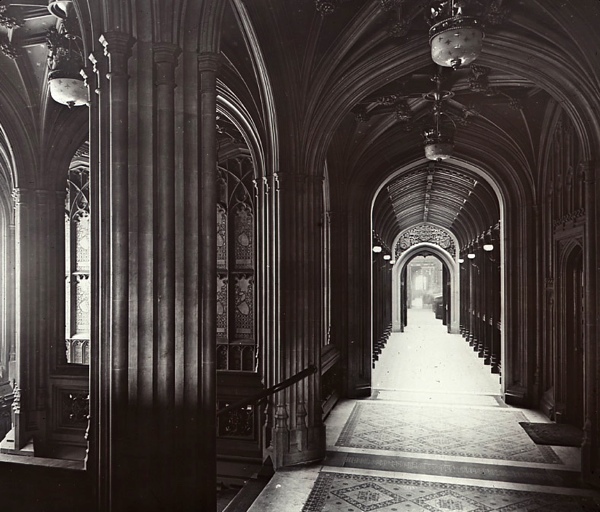 House of Lords, staircase and corridor, c.1920. 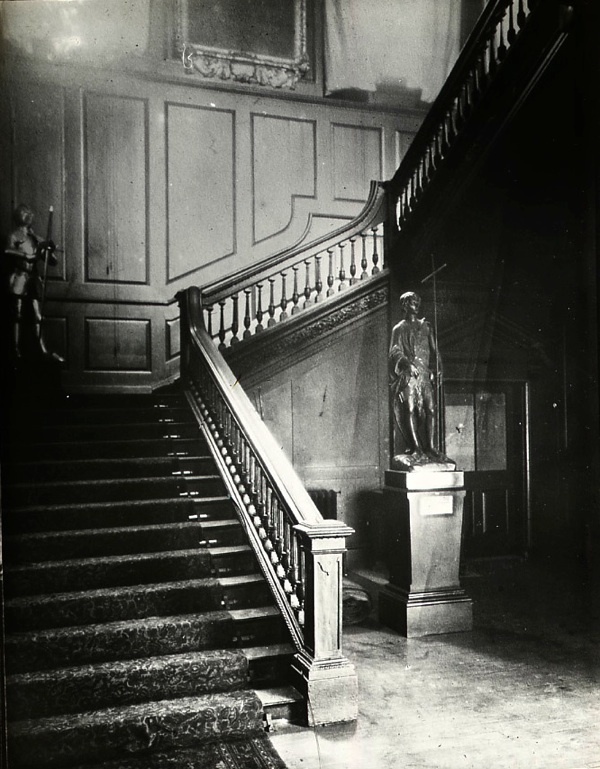 Fishmongers’ Hall, marble staircase, c.1920. Cromwell House Hospital, Highgate Hill, c.1930. 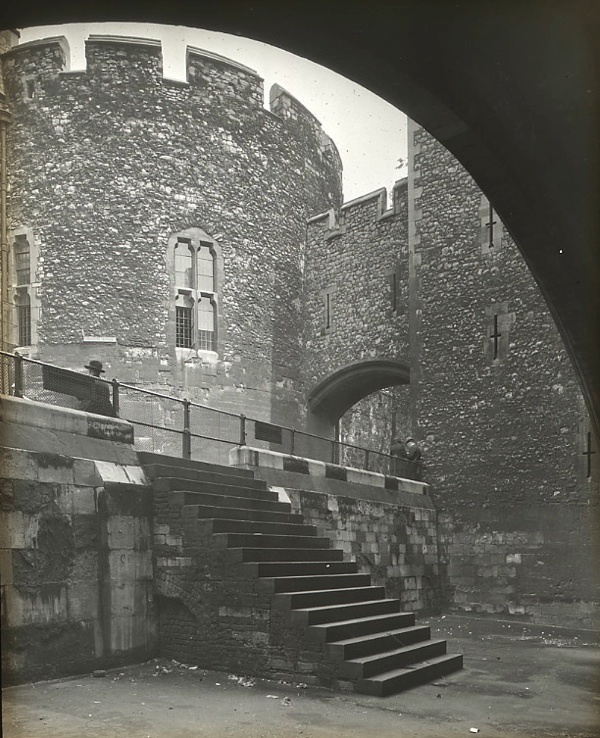 Staircase at the Tower of London, Traitors’ Gate, c.1910. 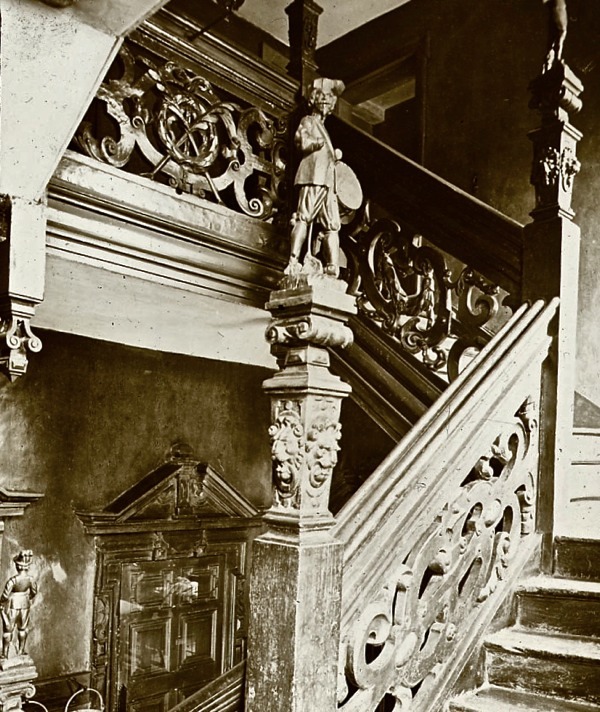 Hogarth’s “Christ at the Pool of Bethesda” on the staircase at Bart’s Hospital, c.1910. 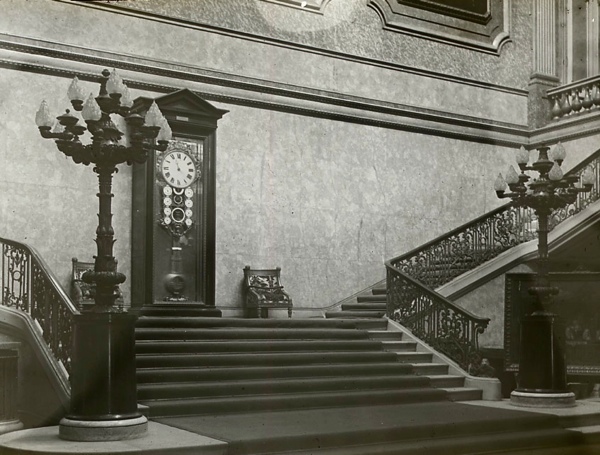 Salters’ Hall, Entrance Hall and Staircase, c.1910. Holy Trinity Hospital, Greenwich, c.1910. 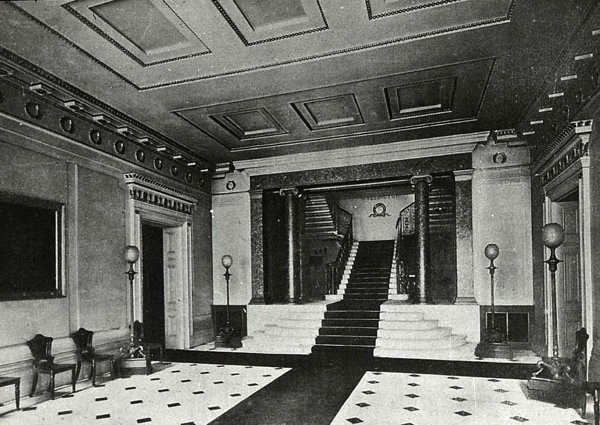 1 Horse Guards Avenue, 1932. 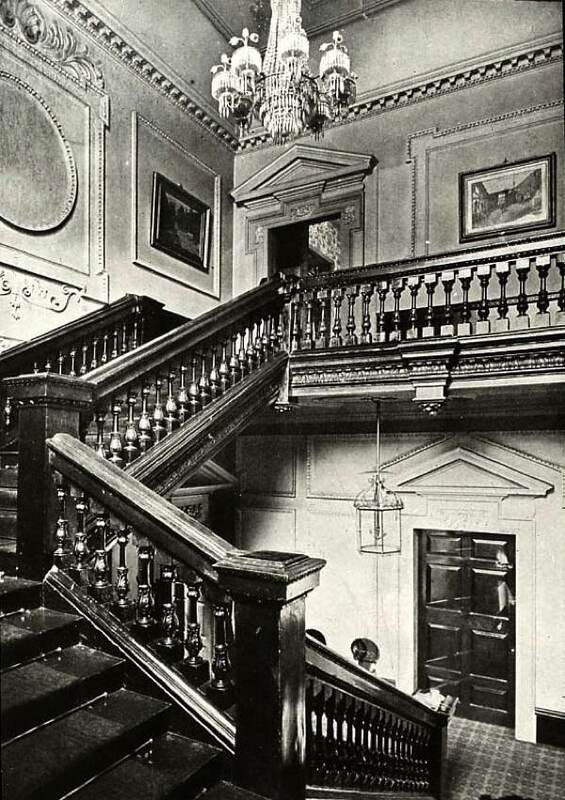 Home House, Portman Sq, c.1910. Great pictures. 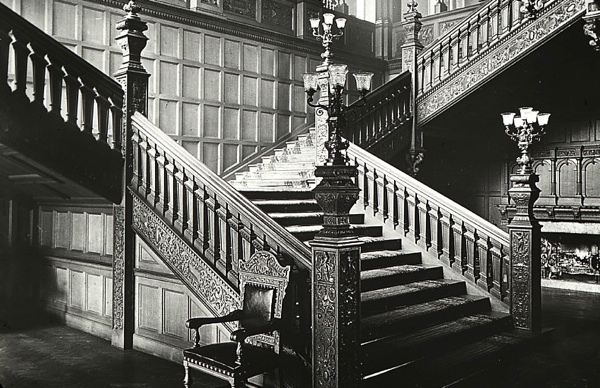 I love staircases and these are wonderful examples. However, there are some others worth seeking out in London. 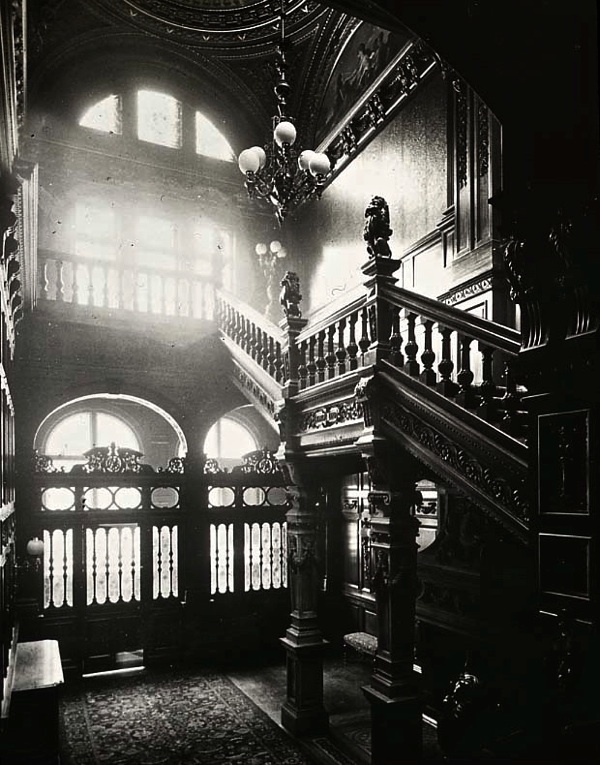 The best is to be found at 2 Temple Place, a neo gothic mansion, tucked away behind Victoria Embankment Gardens, built for John Astor. 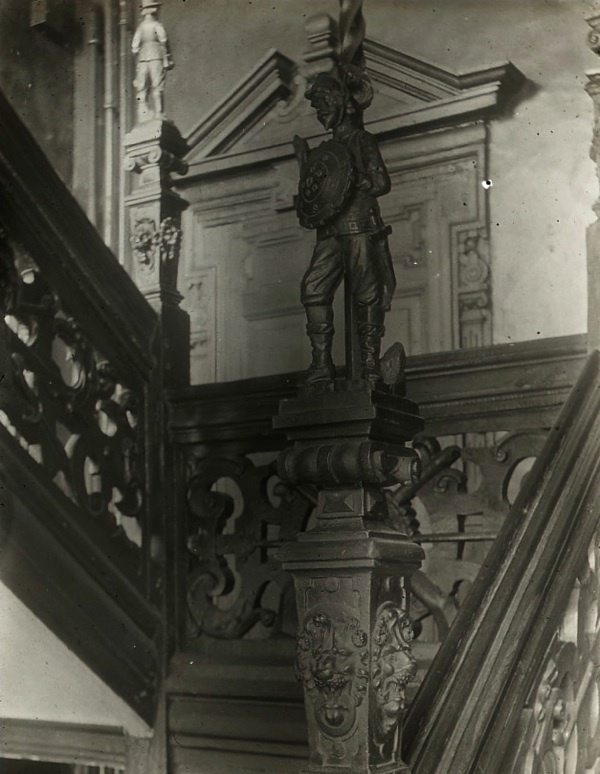 Inside is a magnificent staircase with carved figures of characters from famous novels. 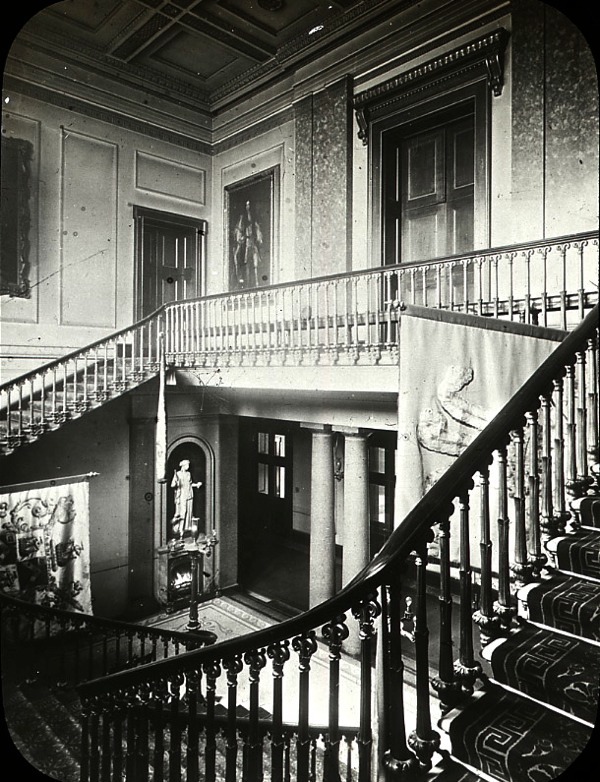 The building is open to the public – free of charge – once a year. 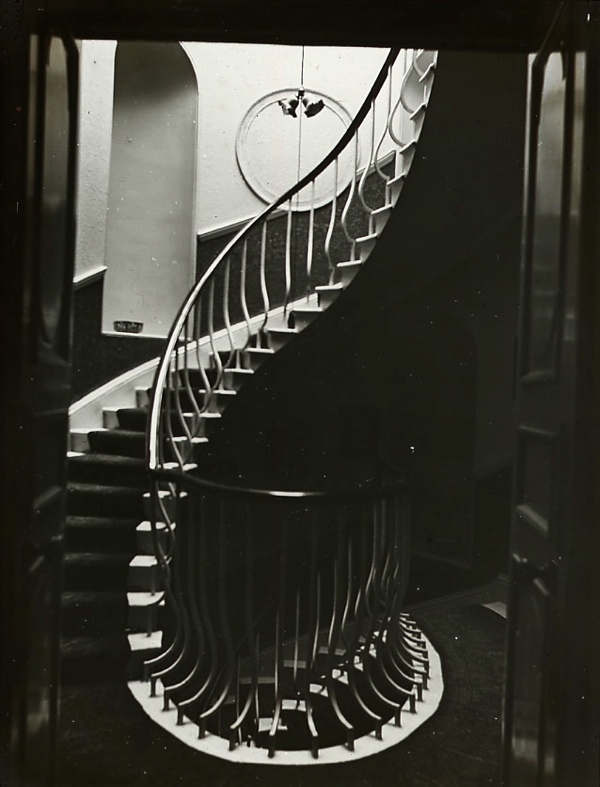 There is also the famous spiral staircase inside Heal’s department store in Tottenham Court Road, designed by Cecil Brewer. 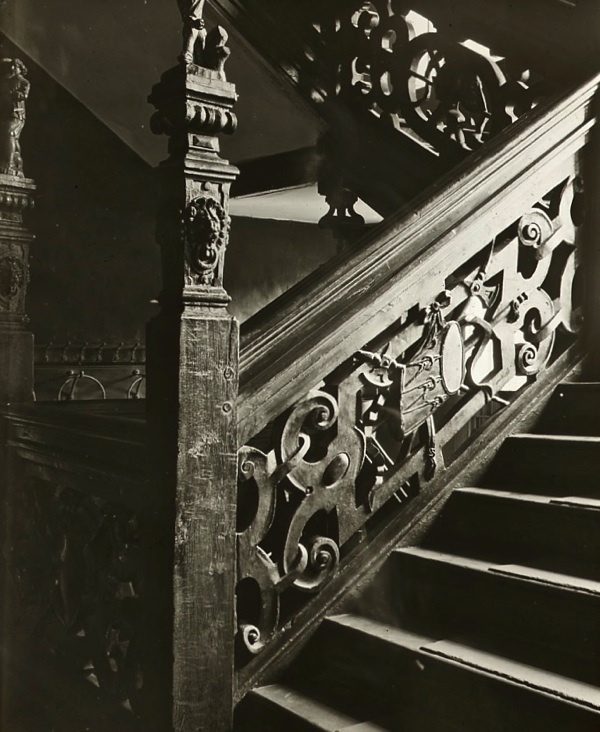 There is a wonderfully ornately carved wooden staircase within No 2 Temple Place, very near Temple Station, although the building is only open to the public for their annual exhibition between January and May. I expect they would open their doors at any time for you though! How unexpected… a delight to the eye, and SUCH a charming narrative. Beautiful old interiors. What’s a Girdler? Well, makers of griddle irons until the sixteenth century when ‘girdles began to go out of fashion’. 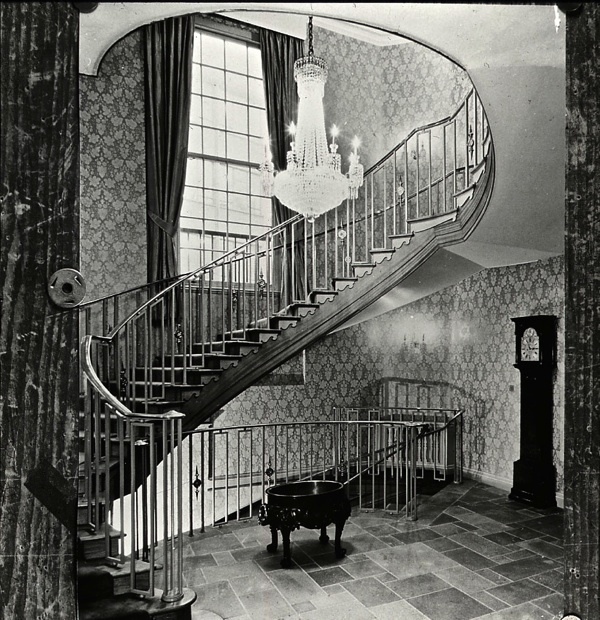 A delightful series of architectural photographs of varying themes grand and purposeful alike newel posts that say something about the owners occupation/preoccupations …from the ancient Cromwell house to the relative modernity of 2 Arlington. 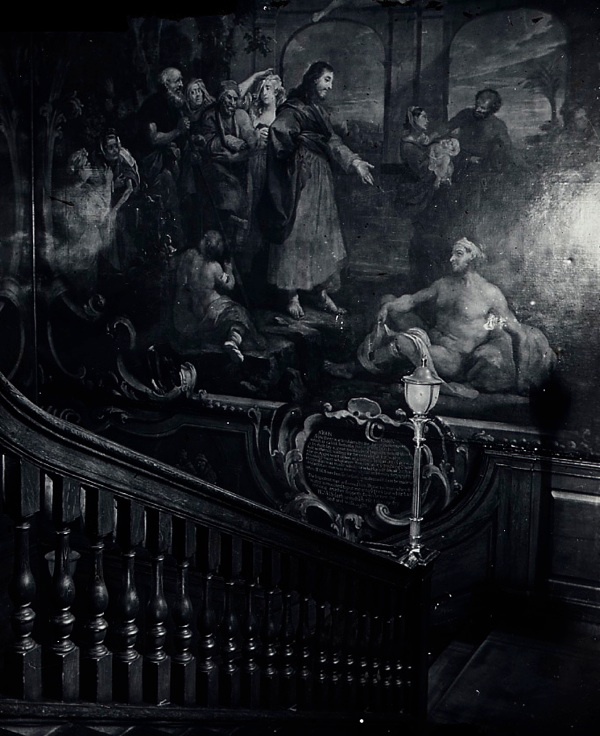 Stairs as processional routes often leading into the light some highlights here for me Hogarth stair painting at London’s Bart’s Hospital can still be seen today and is well worth a visit and for those who can get past the front doorman the bifurcating stair at home house is another delight. Thank you GA. 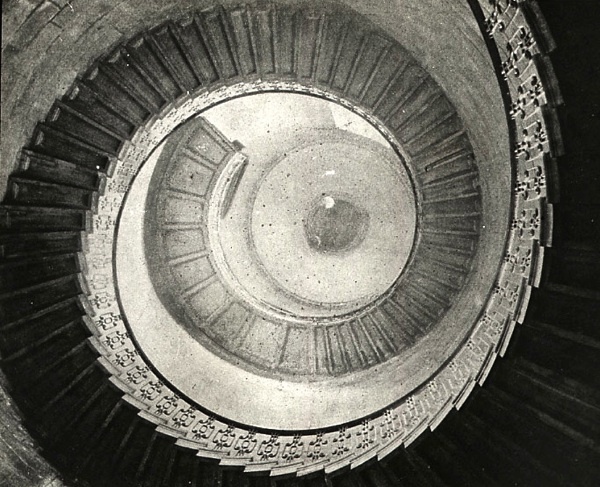 Interesting – but what about some of the wonderful staircases on the tube? 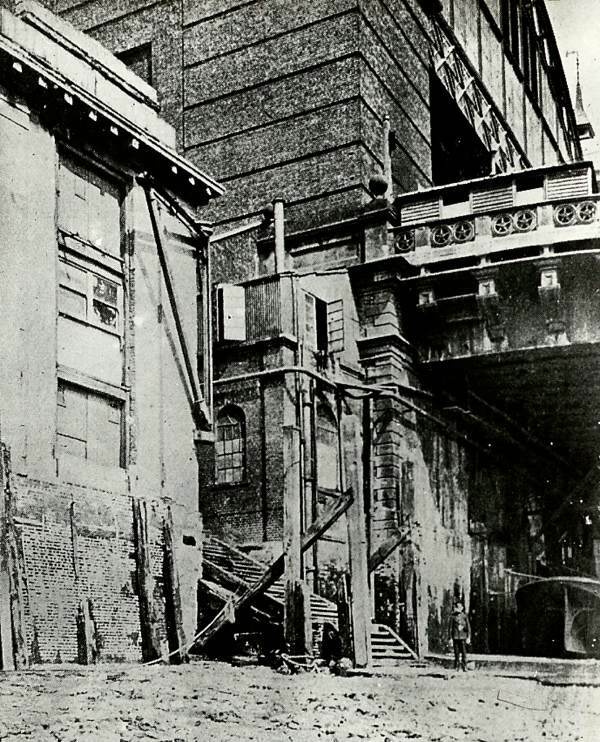 I’m thinking of the northern exit for the Greenwich foot tunnel and also Shadwell, and, of course, the extensive steps at the Bank. I will willingly lead the way up the staircases GA. My father taught me never to be afraid to explore anywhere, and I love staircases. 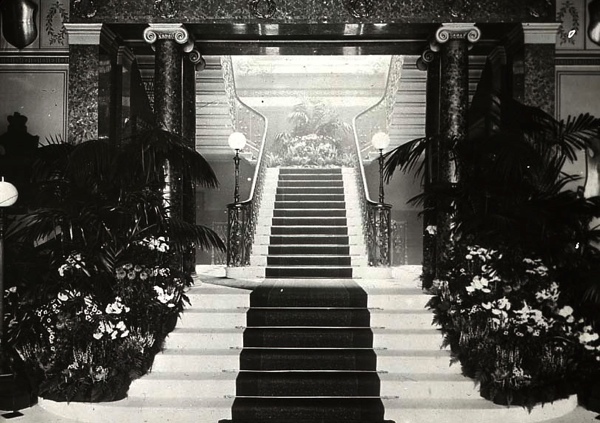 I have always had a dream of living in a house with two staircases, my grandparents had two lots of stairs but only the very modest ones that you get in cottages, nothing like most of these which are designed for grand entrances I guess, I can just imagine ladies in ball dresses coming down!! 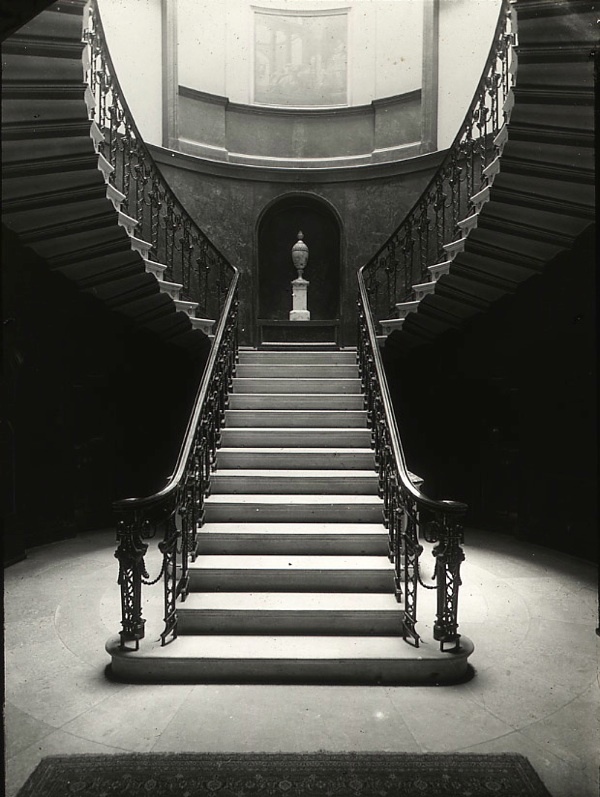 I believe that the staircase in the Queen’s House at Greenwich is something special too. As usual ,beautiful words and pictures. Cromwell House Hospital is now the Ghana High Commission. 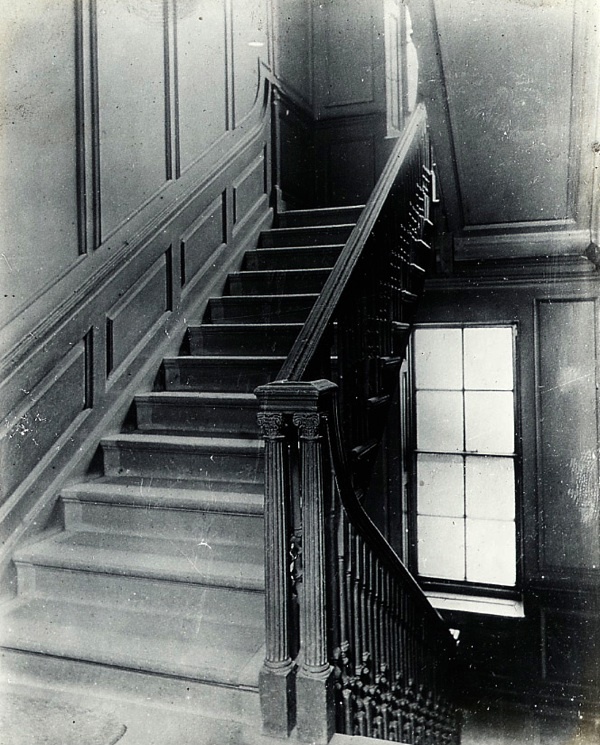 At the time the photo was taken it was probably standing empty, the hospital having moved out in the 20s. It had been the convalescent home for Great Ormond St Children’s Hospital from 1868. 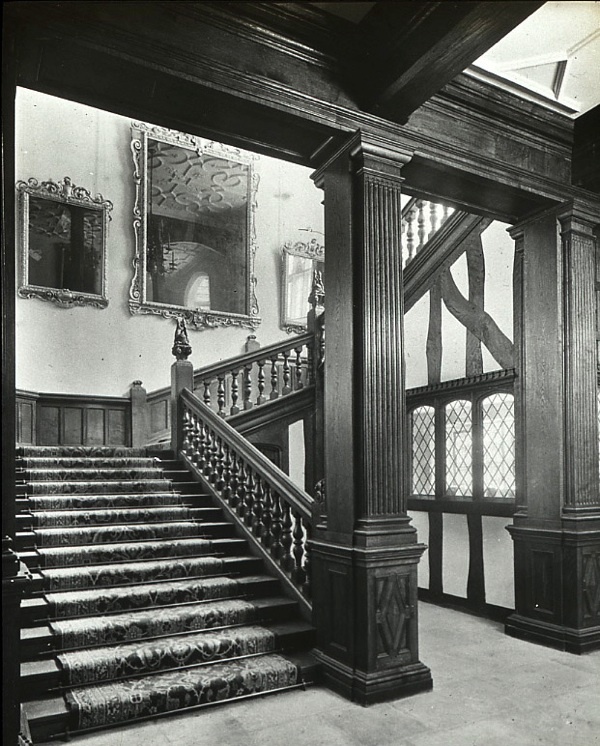 The house was built in 1641 by Sir Richard Sprignell and his family. No one knows where the Cromwell name came from, though Sprignell was known to have been a friend of Cromwell’s son-in-law, John Ireton, who lived nearby, and his heir, Robert Sprignell, married Ann Livesey, daughter of fellow-regicide, Michael Livesey. Robert had no heir so he sold the house before he died. Richard and Anne Sprignell raised a large family in the house before he was declared a lunatic in 1651, after several bouts of madness, and died there in 1654. His wife’s father, Gideon DeLaune, Royal Apothecary and founding benefactor of the Society of Apothecaries, died there in 1659. 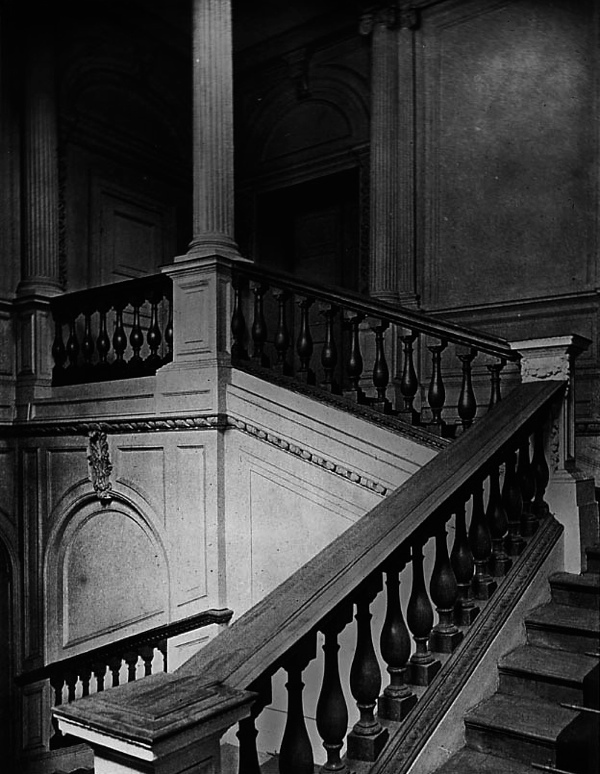 Looking at these wonderful photos, I can see the ghosts of so many of my ancestors on those stairs.